During the last few years we've really refined our diet as a family (see previous blog post), but on Thanksgiving, all bets are off. When it's time to celebrate and give thanks, we do it in style with a big feast. Jordan and I love to cook from scratch, so we spend almost the entire day (and part of the day before) from morning to evening cooking, cleaning and having fun with one another. This year Jordan's parents are coming to visit, so we'll have the perfect babysitters while we're making magic in the kitchen. Our menu is a collection of different recipes we've found from all over. I'm not always the best creator in the kitchen, but I'm DEFINITELY the best researcher. I have searched long and hard over the last few years for great recipes. People always want to share their own special concoctions, but the truth is that the base of almost every recipe comes from someone else. I usually add a twist or two to it, but I mostly trust the people who have spent more time experimenting with food in their kitchens than I have to spare right now. If it ain't broke, don't fix it, right? I remember gagging on stuffing as a kid. I hated it...that was until I made my own, homemade stuffing. Holy Heaven. Bon Appétit knocks this seafood spin on stuffing out of the kitchen. My brother Reece visited us for Thanksgiving two years ago and tried the BLT Oyster stuffing. He went home and told my mom he actually enjoyed it -- and he hates seafood. 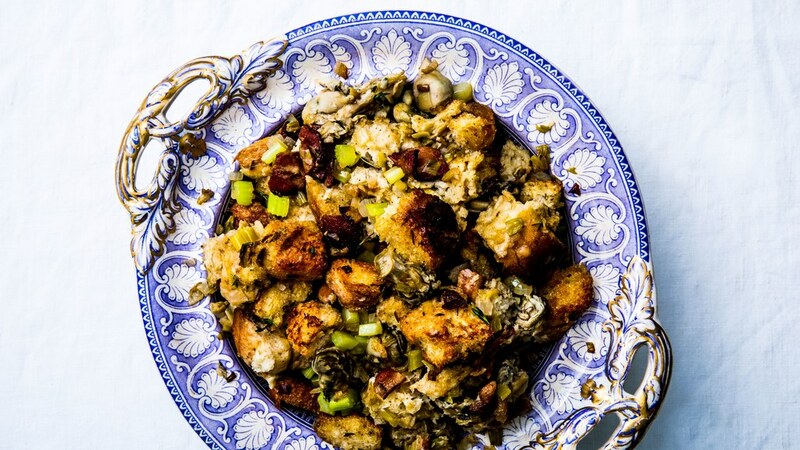 And if oyster stuffing isn't really your thing, Bon Appétit has so many different stuffing recipes you are sure to find something to satisfy your stuffing needs. Just look at this list. One is called, "Cornbread Sausage Stuffing." Say no more. Another Bon Appétit winner. 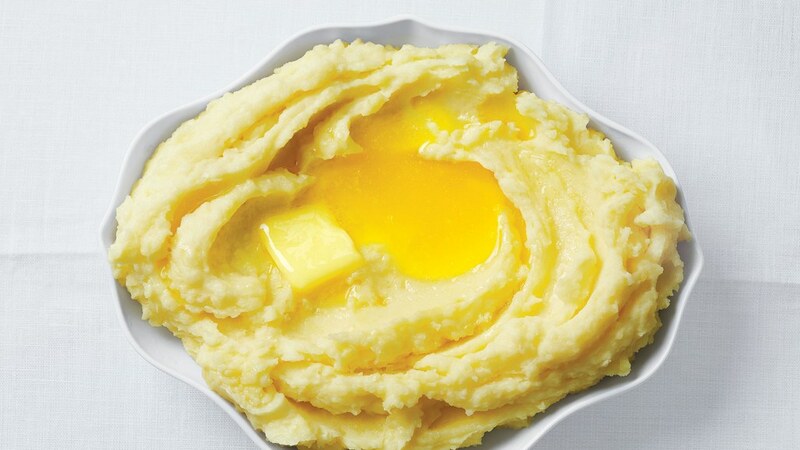 These buttery mashed potatoes are less about the ingredients and more about the process. Well, except the butter. NEVER FORGET THE BUTTER. Speaking of butter, splurge a little for Thanksgiving and buy some Kerrygold Pure Irish Butter to use in your mashed potatoes. Just look for the gold packaging. Also, I love the thyme and bay leaves added to this recipe. It adds a bit of freshness to a classic mashed potato to satisfy your guests but also give them a taste of fanciness to their feast. Who doesn't like to be a little extra fancy on Thanksgiving? So I was going to share Jordan's recipe for green beans here, but since he won't reveal his ingredients (due to the fact that they contain so much brown sugar and honey that they are basically a dessert), I've decided that I'll give you guys a just as delicious, although not quite as sweet alternative. Food and Wine's Green Beans with Preserved Lemon are easy and you can make them a day in advance. Anyone who prepares Thanksgiving dinner knows that's a big deal. You only need four ingredients, not including salt and pepper and they only take 20 minutes. Put them on your menu! Praise. The. Lord. Every year there is always one dessert you MUST HAVE on Thanksgiving. For me, that is apple crisp. But step aside apple crisp, we have a new friend in town. Pumpkin sheet cake with Toasted Marshmallows on top like the cooler, hipper and way more stylish guest at Thanksgiving dinner. If you're trying to impress everyone with your Thanksgiving dessert, bring this. I promise you will be invited back. 1/2 teaspoon lemon zest - get that grater out! In a large pot over medium heat, heat up your coconut oil. When hot, add onion, fennel, celery, 1/2 tsp. salt, and 1/4 tsp. pepper. Let cook for 8-10 minutes, stirring frequently. Add the minced garlic and red-pepper flakes. Cook until garlic is golden brown. Reduce heat to medium-low and add squid. Cook for 15 to 20 minutes, add tomato paste and oregano and cook for another minute. Add wine, raise heat to medium-high, and cook until cooking liquid is reduced by half, 5 to 7 minutes. Add tomatoes and juices, bay leaves, clam juice, and seafood stock. Bring to a boil, reduce to a simmer, and cook, covered for 30 minutes. Stir in 1/4 teaspoon each salt and pepper. Epicurious also has these instructions for the toasts, which if you ask me, top off the dish perfectly: In a small bowl, mix the butter, 1 tablespoon parsley, lemon zest, and 1/4 teaspoon salt together. Cut remaining garlic clove in half and rub the cut sides on the toasts. Spread the flavored butter on the toasts. When ready to serve, heat the pot to medium and add in the shrimp and mussels. 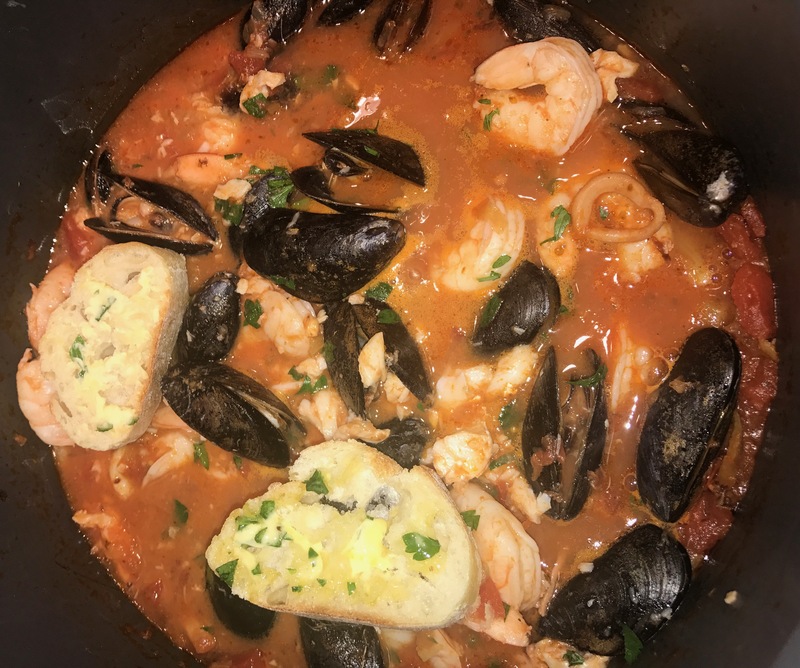 Arrange the fish on top of the stew, cover, and simmer until shellfish open and fish and shrimp are firm and opaque, about 5 minutes more. Discard bay leaves and stir in remaining 2 tablespoons parsley. Serve cioppino immediately in large soup bowls with gremolata toasts alongside. Start going to the grocery story early. I go on Monday and get things I need that won't go bad during the week. I usually go back three more times, ha! But at least if you go early, you have plenty of time to go back for the things you forgot. DELEGATE. Do not feel like you need to do everything yourself. 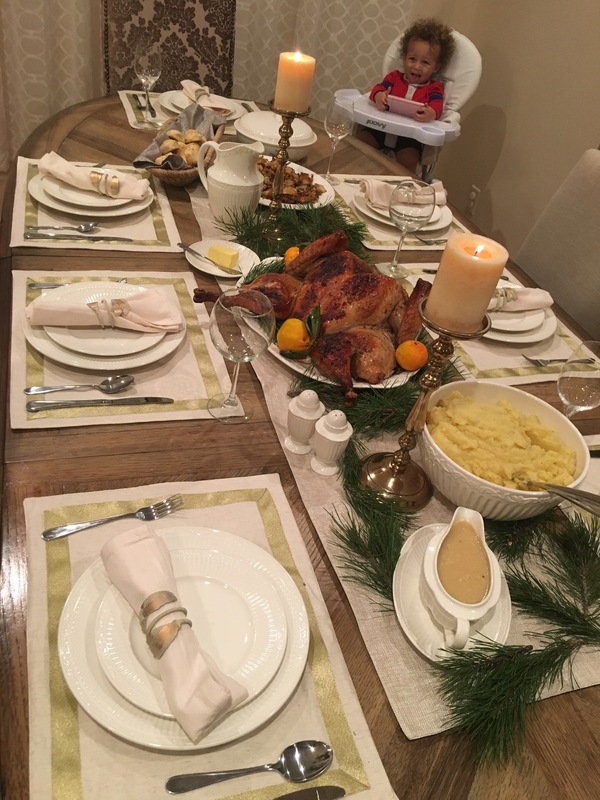 We have cooked the entire dinner (turkey, sides, sauces, rolls, desserts) ourselves in years past. Now I know that there are certain things I don't ever want to cook again. Like gravy for example. I hate cooking gravy. It's annoying. Luckily my friendly neighborhood Whole Foods offers clean, organic Turkey gravy and even vegan gravy! Praise you Whole Foods. Also, allow your guests to help you. It's much more fun, and less stressful when you let everyone in on the cooking and baking. Finally, get fancy. I know a lot of people love to use paper plates and disposable utensils on the holidays. I get it. It's much easier to clean up. But A. It's not helping to reduce waste, and B. It's not fancy! Pull out those nice dishes you received for your wedding. Put out the fancy wine glasses, even if it's just for apple cider. Yes, you'll spend more time cleaning, but you'll truly be "setting your table" for a special occasion. Speaking of cleaning, save the cleaning until your guests leave. When I was a kid, all the wives in our family would spend a good chunk of the party cleaning up while the husbands watched football in the living room. The women in my family are incredible people with such servant hearts! But I was always a football girl and I told myself that whenever I was married, I'd save the cleaning until after the guests leave. Enjoy your time with your friends and family. Break bread, give thanks, and truly enjoy the company of good people. Thankfully I'm blessed with a husband who loves to clean and do his part after everyone leaves too. Most importantly, don't forget to understand why you're throwing a big celebration. Don't get so caught up in the stress of preparation that you can't truly enjoy the process. Dance in the kitchen, laugh with your guests, and make sure you thank God for giving us a seat at the greatest table of all. Happy Thanksgiving everyone!